One evening last week, as I was reading Khaled Hosseini’s novel The Kite Runner, I paused at the end of a paragraph. That paragraph, I realized, had just given me exceptional pleasure. An aesthetic pleasure, to be sure, but no less keen for that. There are many reasons why a reader might relish this paragraph. My own enjoyment stemmed, in a general way, from the clarity, directness, and freshness of Hosseini’s prose. More specifically, it derived from Hosseini’s sensuous, evocative imagery, his deft handling of cadence, and his construction of an intimate narrative voice: that of a grown man tenderly recalling his childhood. Experiencing all those qualities and more, I experienced the complex pleasure they provided. Yet, had I not paused, I might never have realized what I was experiencing. Almost certainly, I was thinking as I read, but thinking is not the same as realizing the experience one is having, an experience that includes but is not limited to thought. Understandably, much of our educational effort focuses on teaching students how to think, critically and conceptually. Far more rare, however, is systematic training in how to realize what one is experiencing. And toward that end, meditative practice can play an important, complementary role, not only in education but also in our everyday lives. In speaking of realization, I am not referring to what James Joyce rather grandly called an epiphany: a kind of revelation, often experienced in the most mundane surroundings. Nor am I speaking of what Robert Frost called a “clarification of life”: that “momentary stay against confusion” which good poems, often in their closing lines, can engender. Rather, I am speaking of what the American historian Drew Gilpin Faust, in her book This Republic of Suffering, describes as the act of “realizing.” Events occur, whether we want them to or not. To realize those events, Faust asserts, is “to render [them] real” in our own minds. ** In the language of Zen, it is to make occurrences within and around us present to our awareness. There are manifold ways to accomplish that purpose, but for the Zen practitioner the central way is the practice of zazen, or seated meditation. In practicing the form of zazen known as shikantaza, or “just sitting,” one sits without an agenda, object, or method, other than to assume an upright, relaxed posture, settle into stillness, and become present for whatever is going on. Breathing in, we know we are breathing in; breathing out, we know we are breathing out. If we are experiencing elation, we are aware of it; if we are experiencing craving, sorrow, or anger, we acknowledge those passing emotions as well. Maintaining the relaxed, aligned, and resilient posture of zazen, we may find that our balanced posture itself is helping us remain open to whatever comes. For, as Shunryu Suzuki Roshi once observed, the posture of zazen allows us to accept the disagreeable with the agreeable. It allows us to realize what is there. That is difficult to do under the best of circumstances, but it is especially challenging if the reality we are experiencing runs counter to our preconceptions, prejudices, or deeply held beliefs. In This Republic of Suffering, Drew Gilpin Faust provides dramatic examples of that challenge, as she examines the tension between the Victorian belief in the “Good Death” and the horrific realities of the American Civil War. Prior to 1861, she explains, the “prevailing Christian narrative” portrayed the believer dying a natural death at home, surrounded by family and leaving this world in a state of peaceful acceptance. But the realities of the Civil War were otherwise. Men died in unprecedented numbers—7,863 were killed at Gettysburg alone—and often in states other than peaceful acceptance. Beyond that, the fact that so many died and were buried far from home, often unidentified, deprived their survivors of a concrete, necessary certainty. In the absence of irrefutable physical evidence, it became difficult, if not impossible, for loved ones to realize their loss, accept it, and move on. In one poignant instance described by Faust, a grieving widow requested that her husband’s remains be exhumed from their faraway grave. Only then could she fully realize the loss she had incurred. Only then could she begin the process of mourning. Fortunately, the stakes are seldom so high in everyday life, but the choice remains much the same. Whether we are reading a novel set in Kabul or witnessing, at a distance, the latest atrocity in Syria’s own civil war, we can content ourselves with thinking and having opinions about our experience, enlisting the abstractions of language for that purpose. Or, with the help of meditative awareness, we can endeavor to realize our experience, fully and concretely. And much depends on the difference. * Khaled Hosseini, The Kite Runner (Riverhead, 2003), 48. ** Drew Gilpin Faust, This Republic of Suffering: Death and the American Civil War (Knopf, 2008), Kindle edition, 2275. 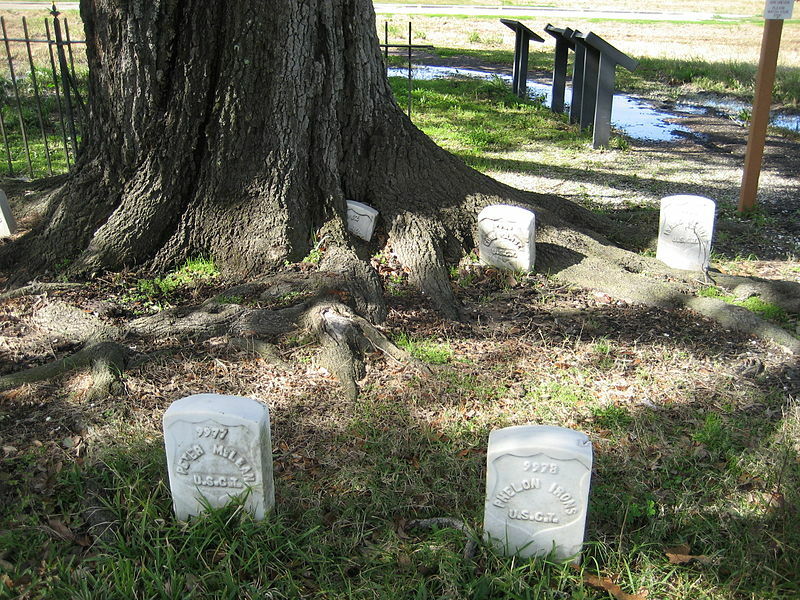 The photograph above depicts the graves of the “US Colored Troops,” overgrown by a tree, in the Chalmette National Cemetery in Chalmette, Louisiana. Photo by Infrogmation.